Are You a Frog in Hot Water? - Jump Out Before It's Too Late! I stepped on the scales today, looked at the number, and said, "Uh-oh." I won't tell you what the number was. You might think it's not much. Or you might think it's a lot. The important thing is the "uh-oh." Like the mythological frog who jumped into a pot of cool water that was slowly warming on a fire. The warming was so gradual that the frog didn't notice the changes. Eventually, the water reached the boiling point and the frog was cooked. People aren't frogs. They're intelligent beings who can measure and reason and plan and exercise self-control. But there's a problem. There's one thing humans do that frogs do not: humans go into denial. They look at the facts and the truth, and then declare that it isn't so. My mother died of complications from Type II diabetes. Over the years, she slowly gained a lot of weight. I don't think she ever thought of herself as obese, but she was. The truth settled in when her doctor told her she had diabetes. But by then it was too late. Her symptoms were so disabling that she couldn't do the work to lose the weight. My business partner, Meredith Bell, is a very positive person. In one of her Voice of Encouragement videos, she talks about identifying your greatest talent. What's your special genius? Maybe you should also make a point of identifying your most troublesome behavior pattern. Own up to it right now, before your situation gets worse - while you can still do something about it. I've written several articles on this blog about changing behavior. Maybe there's something there that can help you move in a new direction. I'm with you on the end-of-winter weight gain, buddy. It's not totally out of hand yet, but I think I'm starting to croak like a frog. Laugh. This definitely has happened to me. It is so easy to slowly move in an undesirable direction. Always need to find a way to get regular feedback. Easier to accept where you are when you can easily see where you've been. journals, etc, help with this. Interesting, and a useful point on changing before it's too late, but the frog metaphor is flawed. Any frog would jump out of the water as soon as it got to be uncomfortable. 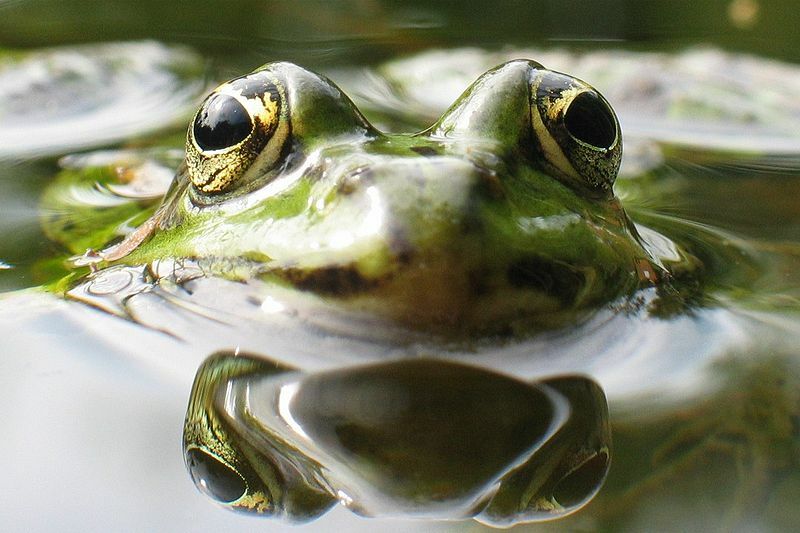 Frogs may not be brilliant change agents, but their senses work just fine.